Chapters marketing strategy: shop elsewhere? For the first time ever, Chapters disappointed me today. And that's hard to say. I'm a huge fan of Chapters and a very good customer. I know that my liberal heart should beat for the independent bookseller, but Chapters just has sooo many books. Resistance is futile. Except, it would seem, today. Last night I was watching CNN and the anchor recommended Lawrence Wright's new book The Looming Tower: Al-Qaeda and the Road to 9/11. Of more than 3500 books and articles written about the topic this one is, in his opinion, the best. Recently I have been making little forays into the world of non-fiction and thought this could be my next adventure. I went online to Chapters.ca and sure enough they carried the book. It was listed as a bestseller, 34% off for iRewards members. Sweet. Chapters.ca has a great little feature that lets you know whether a title is in stock at a particular location. My favorite Chapters had 6 copies. Perfect I thought, I can swing by after work and pick one up. I went to Chapters, grabbed the book and as I was headed for the check-out noticed that there was no mention of the bestseller discount. I got up to the counter and asked the salesgirl "I went online and this was listed as 34% off, but I noticed there's no sticker. Is it still on sale?" "Oh", she said. "That was probably just online." What the? She checked the computer and sure enough IN STORE the book was $12 more expensive than online. "I think I'll just order this online then" I said. "Oh but then you'll have to pay shipping, $5.90." came the reply. True, but that's still less than $12 she wanted to charge me. When I asked about the discrepancy another salesgirl told me that "the online Chapters is a totally different company, they often have better prices." So now you're telling me that I shouldn't shop here at all? On what planet does it make sense for a business to undercut itself? To compete with its own brand? I left the book on the counter and walked out of the store empty-handed. I'll order The Looming Tower online. Of course now I'm going to check Amazon.ca and see if they're cheaper. Stymied for several days now I have decided to appeal to the collective consciousness. I am trying to embed a video from You Tube into this blog and I can't get it to work. Specifically I am trying to snag the "Conversational Norwegian with Freakazoid" video (yes Dave, this one was for you). I created a log in for myself on You Tube, I've gone through the steps to connect my blog with the You Tube account. I clicked on "blog video" and filed in a title, post etc. I get the little message that says "this video will appear on your blog shortly" but it's been 24 hours now and nothing has shown up. I went into blog settings to see if perhaps there was some kind of moderation that needed to take place but it's not in the queue either. I know several of you have successfully added You Tube vids to your blogs. Any ideas on what the hang-up is? huggle: [verb] a brilliant hybrid of hug and snuggle. Clearly a word the world needed. I'm not entirely sure how huggling would play out but I'm game. Next time my niece is in town I'll conduct some research. squee: [noun, also a verb] As a noun the sound that comes out of one's mouth, unbidden, at the sight of extreme animal cuteness or in some cases the hottie of choice. As a verb, the act of sustaining said noise. I think the world just got a little prettier. It's certainly more fun. Once again in honour of Kendra's natal day we headed down to Bard on the Beach. For seventeen years Christopher Gaze and company have trod the boards under the tents in Vanier Park and somehow they just keep getting better. Monica, Kendra and I managed to get some of the last tickets to A Midsummer Night's Dream and once again I was impressed. I don't remember the last I laughed that hard during Shakespeare. Kudos to Kyle Rideout for a Billy Idol-inspired Puck and for truly working the striped tights, high tops and a leather vest get up. Very nicely done. I am still applauding. One of my favourite parts of Bard is always the set design. Kevin McAllister has the impossible task of setting two well known and much loved shoes on a single stage with minimal ornament. Year after year he does an amazing job. This year the two mainstage productions, Midsummer and Measure for Measure were set in Swinging London. I don't know who decided that you could create a fairy forest and almost every prop required from a few white umbrellas but somehow it worked. A single mod lounging chair and a few feet of aluminum pipe and there it was, conjured from imagination itself. A fairy forest, a queen's bower, a lover's lament, a triumphant wedding all summond from wherever creativity lays its head to sleep. The only part I didn't like was when Puck took center stage to begin his "If we shadows have offended" speech. Surely it couldn't be time to go home yet. They lit the torches in New York tonight, two blazing beams of rememberance. I pinned small ribbons to my shirt and went to work. It seems strange that we're back here again and suddenly it's five years later. I've been asked to write articles about September 11th a few times and today I took some time to go back and read them. The first was written a few days after the attack and it's so raw. I quoted Emily Dickinson's line about grieving “first – Chill– then Stupor – then the letting go–.” I remember struggling to decide if I should go to work that day, and then once I got there spending most of the day glued to CNN. September 12th I went to worked dressed entirely in black, head to toe, which I never do. I tied a black ribbon in my hair. Since then, one of the things I've learned about myself if that I find symbols soothing. I think in part it's because a symbol is a way of making the intangible, tangible. 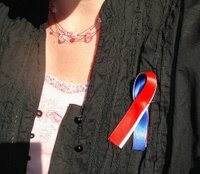 In the days following 9/11 many people starting wearing red, white & blue ribbons and I have worn them almost every year on that day. It's a small way to count myself among the mourners, to say without saying it, "I am sad today too." I think for me, symbols act as a lightening rod for my thoughts, they help me to gather them in one place. Today I've been thinking of the people I usually think of on this day. I think of that haunting image of a man falling from the tower. I think of the school children who saw grown-ups leaping from windows holding hands and what manner of terror could have been behind them that the window was their only hope. I think of three thousand families mourning. I think of my friend's sister-in-law who was supposed to be in the Cantor Fitzgerald offices that day but decided not to go. I think of the people who lined up to give blood and the realization that no one was alive to need it. I think and I remember.